I know looks aren't everything, but I think we can all agree they count for something. With potential mates, sure. But mostly I'm talking about with food. Anyhow, the cake was simple and ready in no time. But it didn't look exactly as I expected. Ok, different bundt pans (mine's better). But the main question is...why does the Bon Appetit cake look perfectly striped and worthy of a midwestern bake sale while mine looks like a giant, suntanned donut? I glared at the husband, although goodness knows he was an innocent bystander. "Does this look like a donut?" I demanded. "A little..." he admitted, assessing my anger level. "Sort of like a big cruller." Then he hoofed it to the living room to escape my wrath. The fact that I cannot stand donuts made this even more upsetting. I blame it on the glaze, although it contains only three ingredients --milk, powdered sugar, and vanilla--pretty impossible to mess up. But mine turned out clear instead of white and although it seemed thick enough in the bowl, it must have been too runny. I can only conclude that the magazine used a different glaze or doctored the photo. Or that I was supposed to add more sugar. But the recipe only suggested that you add more milk to thin it, not more sugar to thicken it. I was a little mad. Why not tell readers how to get the glaze in the picture? That's what we want to make, after all. No one would look at the magazine photo and think, "I'm gonna make that cake, but hopefully it'll turn out with a crummy, thin glaze instead of a nice thick white one." After I huffed and puffed a little, I got over it. A piece of cake helps with tantrums. Mothers have known about this phenomenon for decades. Crying baby? Stuff something sweet in its mouth. Works for grown adults too. I'm going to try it at work, start carrying around rolls of Girl Scout cookies. Lots of crybabies around the office these days but I bet I can silence them with a steady stream of Thin Mints. Anyway, the cake was quite delicious, homely glaze and all. Let's look inside. Nice crumb, right? Fluffy and light...that's the buttermilk talking. And did I mention there's bourbon in this cake? Next time I might add more, to take the cake all the way to boozy. 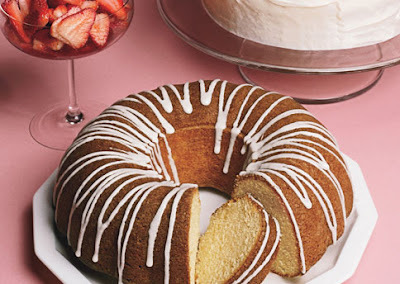 This cake would also be dynamite with vanilla bean frosting. Or chocolate frosting. Or lemon frosting. Will do indeed. i have given up on magazines. they do indeed doctor the photos and perform oddities to keep the glazes and sauces looking right under the lighting. I know a lot of people just look at the word vanilla and think BORING. It is actually my favorite everything. Ice cream, pudding, cake. This looks divine. And frankly, the food stylists do so much to their photos there's no way we amateurs can make our dishes look identical. Usually it's color. No matter, we all know what's good and what's not just by reading the ingredient list! 1-i love your pan--much better than the standard round. 2-i like crullers. nothing wrong with a cruller look-alike. 3-wowza, what texture! bring on the vanilla frosting! Sun-tanned Donut! That actually sounds kinda good to me. 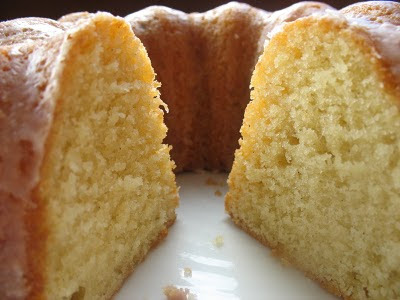 Oh and the texture of that cake looks incredible, well done, who needs glaze anyway. Bob: Aw, I don't begrudge other people donuts. Go for it! A Year on the Grill: I hope you do try it. Maybe with some rum, given where you live these days! Barbara: Vanilla is my fave too. I mean, of course I love chocolate--I think they're both delicious! Stace: well then this recipe would be up your alley! Shaz: I bet your glazes turn out way better than mine, you're practically a pro! I'll get back to you on the meat bundt. It's a beautiful cake with a lovely texture. Forget the magazine photo. You made a great cake. There are a lot of folks that would love the donut "cruller" look. I thought the cake looked quite lovely. No doubt it was delicious. btw, I have all the ingredients out on my counter to make the chocolate spice cake. I am making it this evening. I will let you know how it turns out. That magazine cake is so obviously overcooked, you can see the dryness in the slices. Yours is tender. You win. I have the same pan! I used it to make a different version of a vanilla loaf, which involved 3 vanilla beans and lots of patience. This one looks much easier! Ya know, if you've ever watched food stylists on tv, they always seem to sneak in lots of tricks to keep the image looking perfect and fresh during the shoot. Maybe the glaze in the photo isn't even glaze, but something else that would be thick enough to stand up to the shoot. Your cake sure looks delish anyway! Velva: can't wait to hear your thoughts on the spice cake! this just means - do not judge a book by its cover!! just because bon appetit's picture looks beautiful and gorgeous, it could very well taste like crap! so who cares? 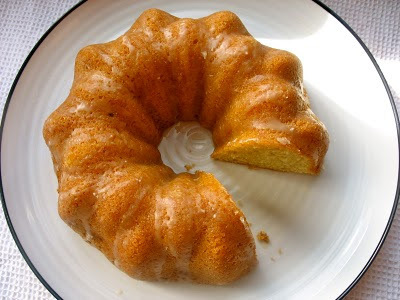 anyway, yours look pretty because the bundt pan is different! You did an awesome looking job with the instructions you were given. That really stinks about the glaze issue. Thats one of the reasons why I like Martha Stewart so much. She's always very consise. With a nice strong cup of coffee. Heaven!! My glazes always end up runny too-what's up with that? You know, I have to admit that if I saw that Bon Apetit shot, I probably would have made it too. It does look enticing! But my conspiracy theory is they didn't use a glaze and instead use a frosting that they piped onto the bundt cake. Or I wonder if you let the glaze cool a bit in the bowl and then piped it maybe it'll retain a more white color when cooled? Anywho, I do like vanilla bean but am hesistant to make a recipe using it because of the outrageous cost of one bean! 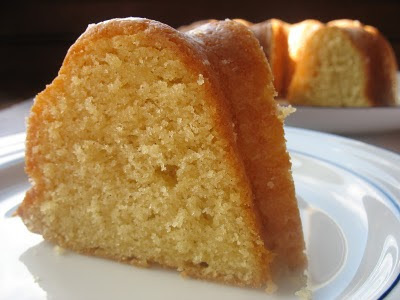 The cake did look yummy and the lemon glaze sounds like a good idea! Giving a recipe for a powdered sugar glaze is always a dicey situation. I've never really made them according to a recipe, more like starting there, and then adjusting the consistency as I see fit. I'd say the glaze in the photo probably has WAY more sugar in it, or it was a less humid day, or the cake was stone cold, or all of the above. Your cake version looks so appetizing & fab even!! foodhoe: lucky girl to have so many bundt pans!! Krissy: thanks! and you're right--what counts is how it tastes! HH: I should give Martha more of a try--I don't have any recipes of hers but always hear positive feedback about them. A Little Yumminess: sounds perfect! tamilyn: more sugar I guess? Beats me! Ben: you're right about the vanilla bean being expensive...luckily I had one leftover from a Penzeys bottle of vanilla extract! camille: I should have fooled around with the glaze a little, tried to thicken it. Next time I'll know! Yum! I so want to make this for Easter. My cousins are bringing their young kids. Too much bourbon to serve to them, or okay? Have missed my blog time these last ten days. Can't wait to catch up! Ash: Oh, no the bourbon would be fine. It's only a teaspoon I think...can't even really taste it in my opinion. Welcome back from your trip-can't wait to see your pictures on FB! I think your cake looks great! Thanks for the very funny and informative review. 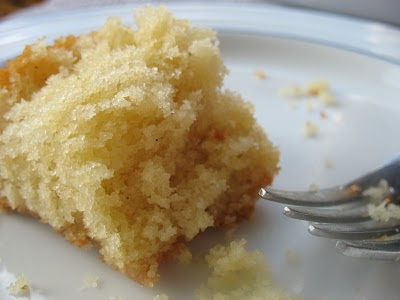 Try this drizzle icing next time, since I tried this one I have never used another. Combine the following, drizzle to your heart's content, sets up beautiful and white. It doesn't really taste like anything but I bet you could add vanilla or lemon. One last tip: I have had great luck finding cheap(er) vanilla beans at Walmart. Alis: you should give this a try...get Seth & RB to be test judges. Michelle: Thank you for visiting and for your no-fail recipe! I will definitely use your go-to recipe next time and jazz it up with vanilla or lemon, Thanks! I had the exact same experience making this cake. It was more donut-like that I had expected. Now I must admit, I would not have made the cake from the Bon Appetit pic - it looks dry and boring to me. But when I look at your pic it looks like something I would definately try, much moister looking. Mollycookie: I'm glad to know I wasn't the only one! ANd thanks for visiting! Wanda: Thank you! And thanks for stopping by! Magazines use professional photographers and food stylists that position every little crumb in the photo. The glaze on the cake in Bon Appetit is probably some kind of thick white glue that is CAREFULLY and SKILLFULLY placed JUST SO. Butter in a photo is never butter, maple syrup is never maple syrup, ice cream is usually a potato mixture, etc. The water droplets in a photo of nice juicy grape have been put there every so carefully. The crumb of that cake was probably combed. I used to date a commercial photographer and can tell you that it can sometimes take 1/2 to a whole DAY to take a photo like that! So, stop beating yourself up about the glaze. Did you wait until the cake was completely cool? That can make a huge difference! P.S. I make my own vanilla extract and buy my (organic) vanilla beans on ebay. I can get a pound of them for less than $20. 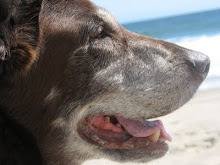 Laurel: Thanks for your comments, and your reassurances. I know you are right--us home cooks just can't compete with professional food photogs (and who cares to?) Thanks for the vanilla bean tip! I love the photos too. If it doesn't look delicious, I am not encouraged to make it. So true Laurel, all freeking day to take one photo! But what's most important is taste. Did it taste delicious? Of course! Well done then! Success! I think yours looks rather English elegant...with Yerba Matte' green tea. Love the pan shape. Country Captain, or Captain Chicken?